In case you can’t tell by his name, Kit Fisto is one of the coolest dudes around. He’s a Nautolan, which explains why he loves an underwater battle. But even when he’s on dry land, he still smiles like he’s having the best time ever. He’s focused during battle, but clearly knows how to cut loose and have a good time. He’s the kind of Jedi I’d grab a beer with, anytime! Using his knack for strategy, and super fast swimming skills, he helped the Mon Calamari defeat the separatist-backed Quarren. He also saved Ahsoka from freezing to death, and force pushed 3PO to safety when he was half Roger Roger droid. I wish we would have had more time with Master Fisto, before his ultimate demise. Let’s all tip a bowl of spinach linguine in his honor. 2. In a separate small skillet, heat the olive oil over medium heat. Add the garlic and cook until the garlic begins to sizzle. 3. Reduce the heat to low and cook until the garlic is soft and light gold-colored, about 3 minutes. Remove from the heat, and set aside. 4. Once your water is boiling, add the kale and cook until the leaves are tender, about 5 minutes. 5. Use tongs to remove the kale from the boiling water, and put them into a blender, or large bowl if you’re using an immersion blender. DON’T drain the water! You can use it to cook the Linguine. 6. Add the garlic, oil, and a little bit of the boiling water to the bowl with the kale. 7. 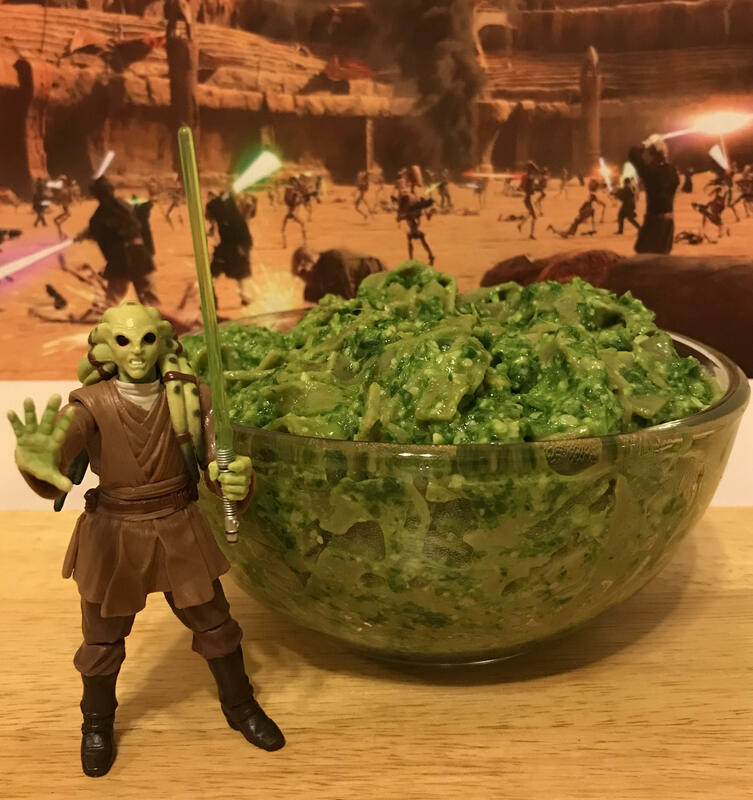 Blend into a thick green puree. Add salt and pepper if needed, and set aside. 8. Add the linguine to the boiling water, and cook for 9 minutes. 9. Drain pasta, reserving a cup of the water first. 10. Place cooked pasta back into the dry pot. 11. Add the kale puree, Parmesan cheese, and a little bit of the reserved pasta water. 12. Toss until the pasta is well coated and bright green, adding more pasta water if needed. 13. Serve immediately with more Parmesan cheese, and a drizzle of olive oil. 14. Enjoy before a Sith Lord vertically spins through the air at you, while screeching maniacally.